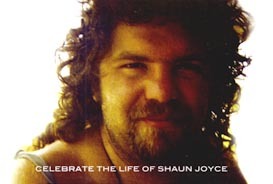 Shaun Joyce was a hugely popular, high-profile person who touched many people in his short but spectacular life. This memorial is dedicated to Shaun and the impact he had on so many of us. If you would like to contribute stories, memories or photos, please contact us. C4 music channel ran a Van Halen special on September 5th 2004. Before and after the show, a message appeared saying "in memory of shaun joyce, who wore his van halen t-shirt to heaven". Billboard Magazine apparently ran an obituary. Numerous websites and blogs mentioned Shaun's passing during August and September 2004. As we understand it, at least two radio stations paid tribute to Shaun. If anyone can provide further details we'd be grateful.